We have become so reliant on technology in the past few years that it’s no surprise that the Olympic Games 2012 will be managed, run and monitored through technology. With over nine million tickets being sold and millions of viewers throughout the world watching, new programs were needed and new designs were put in place to ensure that everyone will get the most out of their Olympic experience. The IT structure for the 2012 Olympics is advanced, it processes over 200,000 members badges, co-ordinates the staff rotas and delivers results in real time. The new technology is used to oversee and compute results. The technology centre is staffed by four hundred and fifty staff members and is monitored all day every day during the games. What does this mean for spectators watching at home or on the internet? The information is up to date in real time with thirty per cent more data being streamed than the Beijing games; ensuring fans get the latest results as they happen. Commentators will enjoy new touch screen technology both in London and in their home countries which means they will have the live results as they happen, the information is so fast, and the commentator will know the result before the spectators start shouting with delight. Those attending the games won’t need to carry cash to take advantage of the over 5,000 retailers. The new swipe system will swipe cards over a reader, speeding up payment processes and reducing delays and queuing times. The streaming of live events is smoother and faster to both computers and smart phones, those with smart phones are able to download apps which have been developed to give fans access to constant live streaming of their favorite games. Security is a major part of the Olympic Games 2012. There are lots of sites and people trying to sell fake tickets. This meant that there was additional technology used in the production and monitoring of tickets used at the live events. Tickets for the events each carried their own unique barcode which is scanned on arrival along with a hologram embedded into the ticket, the same as you would find on a bank note. These are scanned and the computer system will determine if the ticket is legitimate or not. All the security for the games is monitored electronically at all times along with security personnel throughout the stadiums and grounds. The increased security ensures safety of all spectators at both the Olympics and Para Olympic games. The games for 2012 will be using sustainable power; this technology will enable the games to produce thirty three per cent less CO2 emissions. With the increased amount of traffic in London during the games, the University of Leicester have taken it upon themselves to produce new technology that will monitor the impact of the increased traffic during the Olympics. 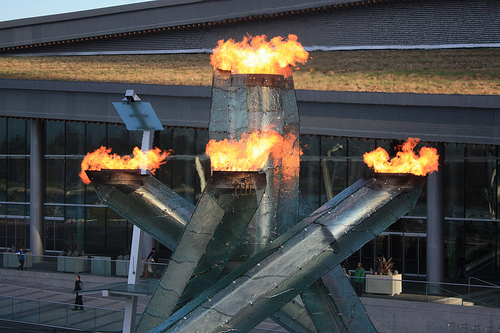 Using two main towers around the main stadium sites, they will monitor the pollution produced as part of their own technology study for the games. Guest Writer : This article was written by Jonny D – a fan of all things tech and sports who currently works for Ladbrokes.